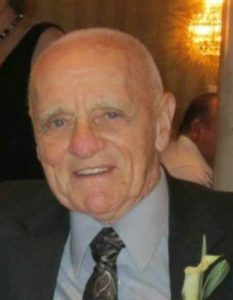 Hudson – Carl G. “Ziggy” Ziegler, 91, of Hudson, died Sept. 7, 2018, surrounded by his family, at Beaumont of Northborough. Ziggy is survived by the love of his life, Jacquelyn (Rougeau) Ziegler. They would have celebrated 68 years of marriage Sept. 23. He leaves seven children, Susan Rucho and her husband Donald of Matthews, N.C.; Kyle Ziegler and his wife Susan of Berlin; Karen Longtine and her husband Brian of Hudson; Sheri Fuller and her husband Robert of Boylston; Keith Ziegler of Berlin; Kris Ziegler and his wife Raquel of Framingham; and Kimberly Ziegler and her partner Ed Travis of Broomfield, Colo. He is survived by his sister, Constance Barter. He was predeceased by his sister, Barbara Neuhaus. He leaves behind his beloved grandchildren, Adam Rucho, Zachary Rucho, Jaclyn Longtine, Leif Longtine, Matthew Fuller and Keri (Fuller) Young, Kyle Martin, Jennifer (Ziegler) Bellany, Joshua Ziegler and Olivia Ziegler. He leaves four great-grandchildren, Maria and Rosalie Bellany, Mary-Arden Rucho and Brayden Fuller. He also leaves nieces and nephews. Ziggy was born in Clinton, son of George and Jenny (Lindberg) Ziegler, and lived in Berlin for 23 years. Ziggy lived with his wife and family in Hudson for 68 years before recently moving to Whitney Place in Northborough. He graduated from Hudson High School, class of 1945. He was a sergeant in the United States Army, and received the World War II Victory Medal and Army of Occupation Medal. He was a lifelong member of the Hudson Elks and the American Legion. Ziggy worked at Lapointe Tool & Die Company before working independently as a carpenter. He was a lifelong member of The First Parish Church of Berlin, serving on many committees. Ziggy coached little league baseball and hockey. He was a member of the Hudson High School Hall of Fame. He loved watching construction projects around town and working on puzzles. Jackie and Ziggy took many road trips up and down the East Coast, vacationing in Longboat Key. He was an avid Patriots and Red Sox fan. “There was no ball player better than Teddy Baseball!” Ziggy compiled two scrap books on Ted Williams that were displayed in the Ted Williams Museum in Florida. Calling hours will be held Wednesday, Sept. 12, from 9-11 a.m., in Tighe-Hamilton Funeral Home, 50 Central St., Hudson. A celebration of life will be held immediately following the calling hours at Tighe-Hamilton Funeral Home. Burial with full military honors to follow at North Cemetery in Berlin. In lieu of flowers, memorial donations may be made to Friends of Whitney Place, 238 W Main St., Northborough, MA 01532.